Ford Mustang Convertible Performance, Engine, Ride, Handling | What Car? If you’re expecting a delicate driving experience, then this is not the car for you. 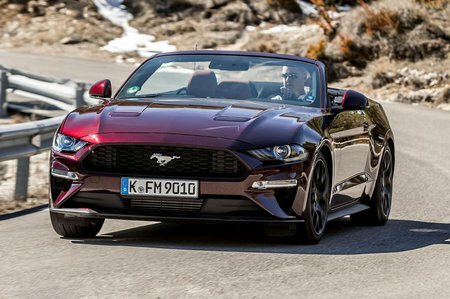 In keeping with the brawny image, the Mustang Convertible's steering requires a bit more muscle and is tad slower than the likes of the BMW 2 Series Convertible or Audi A5 Cabriolet. You can vary its weight using the various drive modes, but it always feels heavier than European rivals. 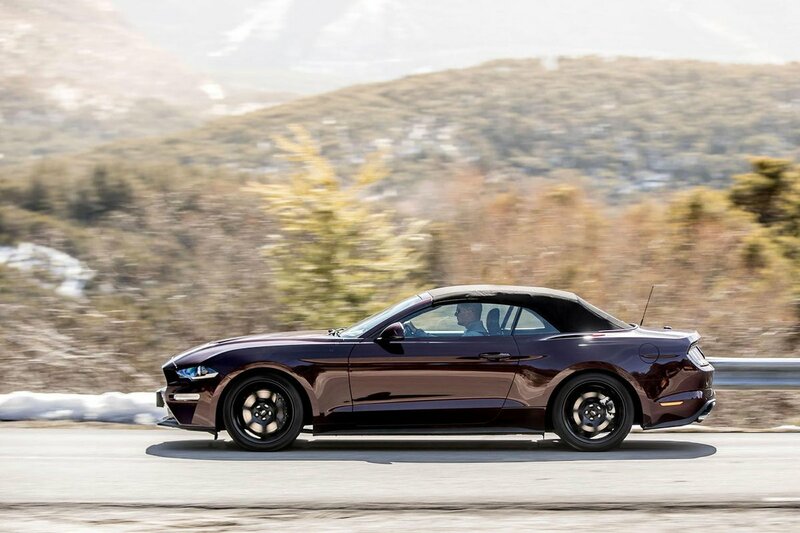 Although it doesn’t turn in quite as sharply as those rivals on account of its weight, the Mustang Convertible has lots of front-end bite and does a good job of telegraphing what the front tyres are doing through the steering wheel. While you can get the front end slipping wide if you enter a corner too quickly, there’s more chance of the rear sliding if you’re too greedy with the power on corner exit, especially if it’s wet. Still, this is more fun than frightening. 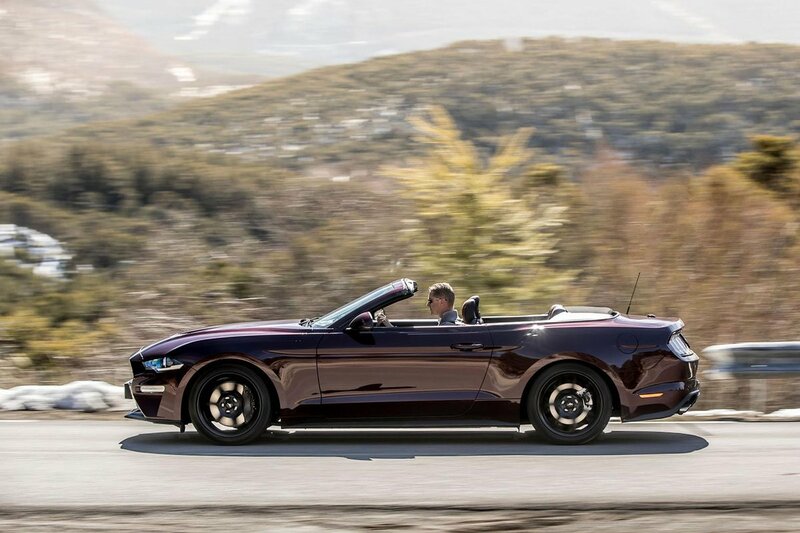 With the optional MagneRide adjustable suspension, the Mustang Convertible does a good job of controlling body movements as you brake, turn and accelerate – this is no mean feat considering even the lightest model is nearly 1700kg. The car even rides well if you leave the dampers in Comfort mode. The standard non-adjustable suspension isn’t quite as impressive, but it still strikes a good balance between ride comfort and body control. Even so, the Mustang Convertible thumps and jiggles around when travelling over crumbling urban roads. You also notice the body shimmy and twist as it travels over bigger lumps, highlighting the reduction in rigidity you get from cutting the roof off the car. Make no mistake: this is a cruiser, not a sports car. The entry-level 2.3-litre turbocharged Ecoboost engine is very flexible, pulling hard from around 1500rpm and doesn’t tail off until you hit 5500rpm, making it feel effortlessly quick. The 5.0-litre V8 feels even mightier, but you have to be prepared to work it far harder before it feels its full 444bhp. How much harder? Let’s just say it does its best work beyond 3500rpm and hits its peak output at a heady 7000rpm. That said, we still prefer the V8. It makes a thunderous noise and (eventually) has the rabid performance that feels appropriate for a car with this kind of presence on the road. Not only is it a joy to work hard, the standard six-speed manual gearbox (which is also in the 2.3-litre model) is slick and has a meaty, mechanical feeling that’s totally in keeping with the Mustang Convertible’s character. The optional 10-speed automatic ’box is rather snappy and can flick through multiple gears in one go. An occasional habit of switching between ratios indecisively is the only slight annoyance. Happily, steering wheel-mounted paddles allow you to take full control when you want to. Instead of feeling like the manual’s poor cousin, it’s just as recommendable and even improves the fuel economy of the V8. With the roof down, you can just about hold a conversation at 70mph, and there’s not too much buffeting, especially if you buy the optional wind deflector. With the roof up, it doesn’t block out wind noise out as well as some rivals, especially the metal-roofed BMW 4 Series Convertible.